Look what just arrived in the mail! 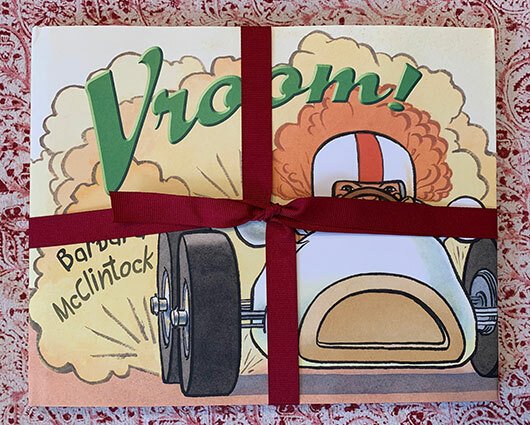 The first real live copy of my latest book VROOM!, published by FSG/Macmillan. VROOM! pub date is July 2nd, 2019 - can't wait! 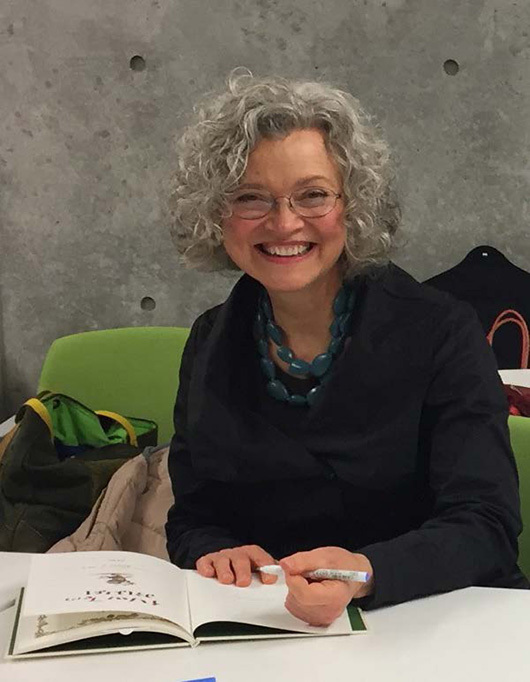 I had a wonderful time at the NCTE convention in Houston last November. 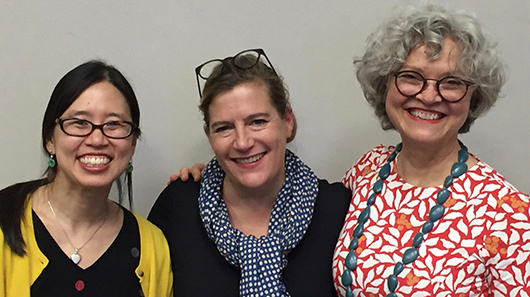 I was on a panel with Grace Lin and Sophie Blackall, two of the most talented and lovely human beings on the planet! And how exciting is it to have been presenting with two of this year's Caldecott winners! Congrats to Grace and Sophie! 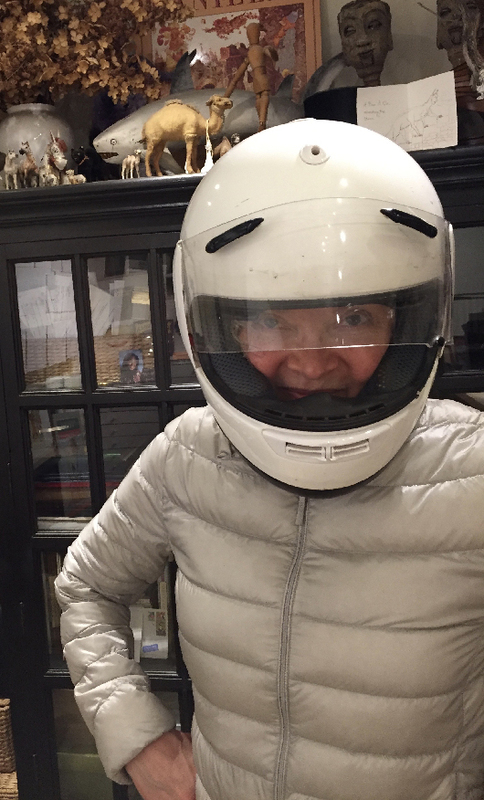 Zipping around the corner for 2019 - VROOM! A girl, a little silver pedal sports car, and a pre-bedtime drive around America. This might be auto-biographical! There’s already been a lot of buzz about my spring 2018 book NOTHING STOPPED SOPHIE, written by Cheryl Bardoe, and published by LittleBrown. 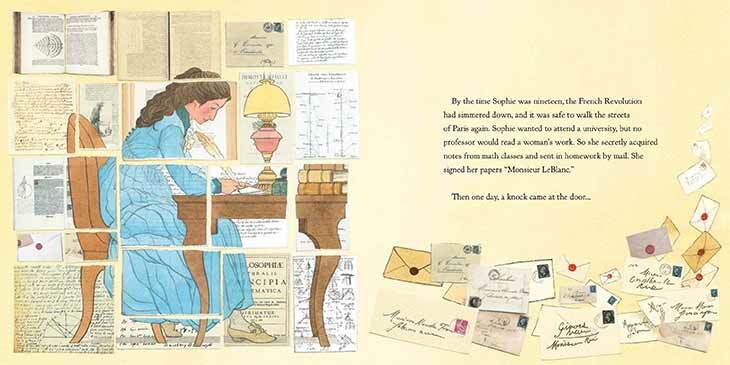 John Schu has been talking about SOPHIE on his city-hopping traveling librarian visits, and Betsy Bird wrote a really wonderful review of SOPHIE on her blog ( you can check out her review on my LINKS page ) Sophie Germaine was a French mathematician who grew up in Paris during the French Revolution. 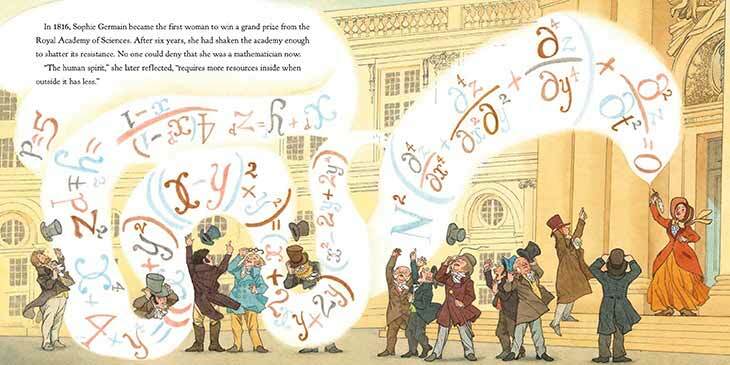 Her prize winning mathematical equasion analyzing vibration patterns laid the groundwork that enabled tall buildings and long bridges to be built. 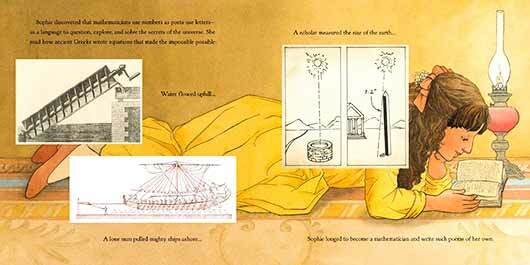 Her work, determination, and mathematical genius is evident in every skyscraper and suspension bridge. Pretty cool! THE FIVE FORMS (FSG fall 2018) has gotten big kudos! I’m so pleased that my venture into a new style of making my illustrations for this book has met with enthusiasm and praise. I was inspired by Chinese and Japanese brush drawings in making the illustrations for THE FIVE FORMS. You can read more about all the crazy animals that come to life, the forms that create those animals, a little girl getting in and out of trouble, and my son Larson’s passion for martial arts that lead me to create this book, on Elizabeth Dulemba’s blog post on my LINKS page. Official pub date December 6th, 2016! This books is close to my heart. 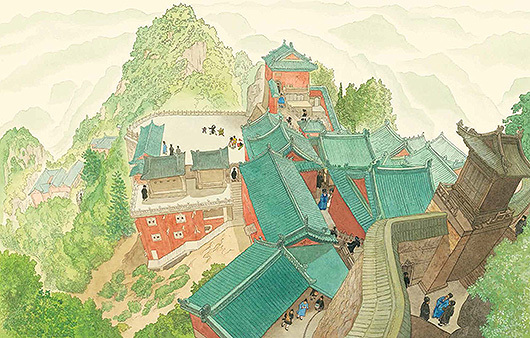 It represents a ten year long labor of love exploring early 20th century China through painstaking research, refining sketches and text, and creating the finished artwork. 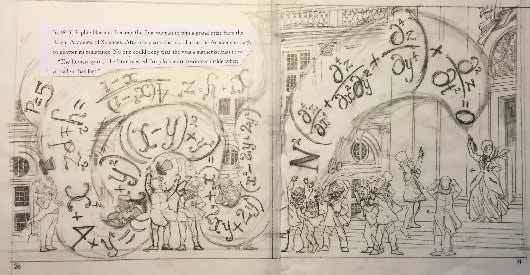 Everything in the book is hand-drawn, other than the map used for the endpapers ( more about that later! ). 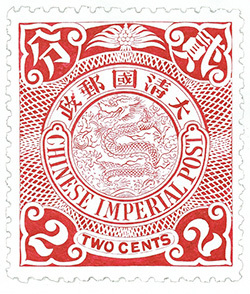 Even the postage stamps, which I meticulously copied in ink from images of authentic Chinese stamps from 1905, and the postage cancellation marks, rendered in grease pencil to imitate original cancellation marks from the early 1900s that appear on the stamps and postcards that Adele sends home to her mother were done without any digital work. The research that went into each scene was extensive and exhaustive - I'm tired now just thinking about it! 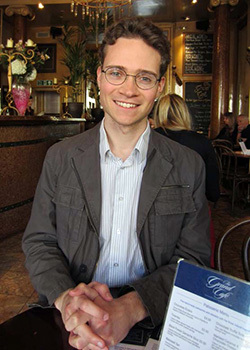 My research guide throughout the book was my son Larson DiFiori, a Doctoral candidate in Chinese religious studies at Brown University, with a master's degree in ancient Chinese language studies from Oxford University. Not only am I extremely proud of LOST AND FOUND/ADELE & SIMON IN CHINA as a book, but it also represents a beautiful connection with my son. 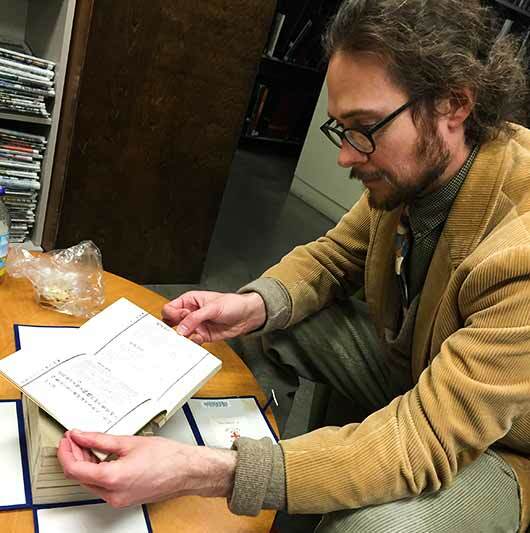 Making LOST AND FOUND/ADELE & SIMON IN CHINA was my way of understanding his passion for ancient and modern China, and I cherish the close connection we had as we worked on the book. There is a back story to the production part of LOST AND FOUND/ADELE & SIMON IN CHINA. 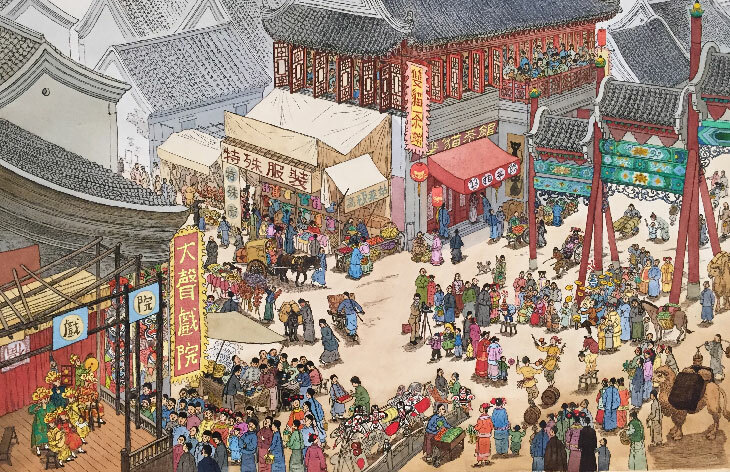 When my publisher, Macmillan, send files of the artwork to their usual printer in mainland China, the work was rejected. 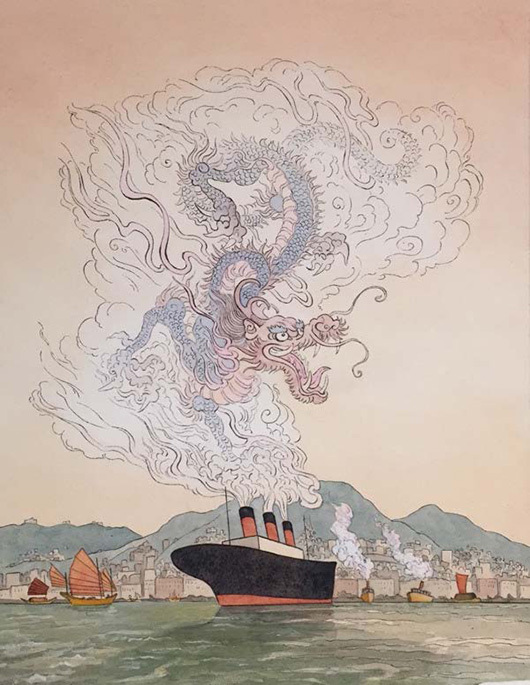 The PRC government officials refused to allow the book to be printed in mainland China because of the original 1905 map of China used for the endpapers. 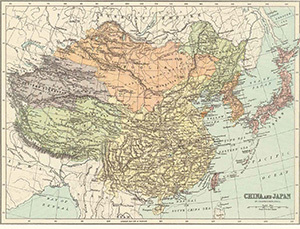 The map shows a historically correct depiction of Tibet as a separate entity, as well as showing Taiwan as Formosa, and German and Dutch colonies near Shanghai. Macmillan had to find a new printer. The first printer was in Hong Kong, but the printing wasn't as clear and true as Macmillan wanted. So a second printer was found in Hong Kong; this printer specializes in producing coffee table and art books. The circuitous route to find a printer has resulted in the most gorgeous, sumptuous printing of any book I've ever made. The color and line work seems to vibrate on each page. The paper is thick and has a beautiful feel. It also meant that the pub date was pushed back by over a month, which led to much nail-biting on my part. But the book is so perfectly produced, that it's well worth the wait. 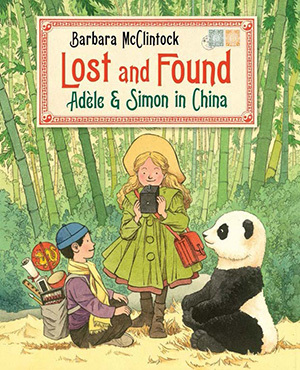 I hope LOST AND FOUND/ADELE & SIMON IN CHINA will find it's way into the hands of everyone who loves seek-and-find books, as well as into the libraries of schools that offer Chinese language courses. 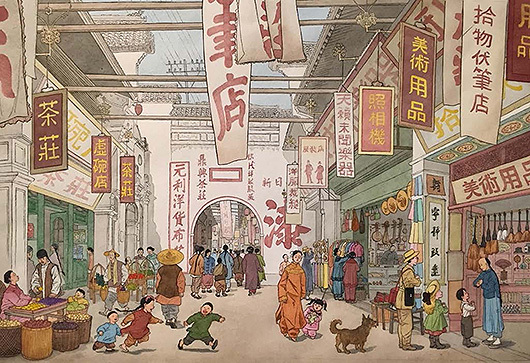 The history of China is fascinating, and I would love to think LOST AND FOUND/ADELE & SIMON IN CHINA might spark discussions about China, history, politics, and just why Chinese men in the early 1900s wore those crazy queues, and faced a penalty of death if they cut them off. There's information about each scene at the end of the book. 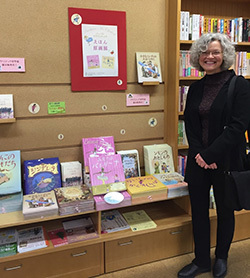 I recently returned from a two week book tour in Tokyo. 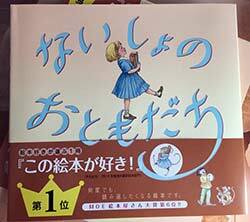 I have 13 books translated into Japanese editions; one of my books, MARY AND THE MOUSE, THE MOUSE AND MARY is a best-selling title in Japan, currently in it's 28th printing there. How cool is that?! 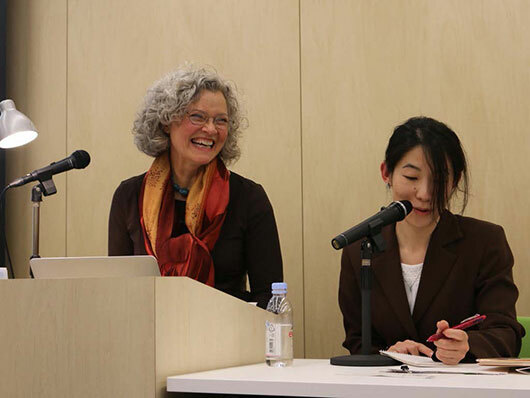 My Japanese translator and friend, Yumiko Fukumoto, was my host and the organizational force behind my tour. 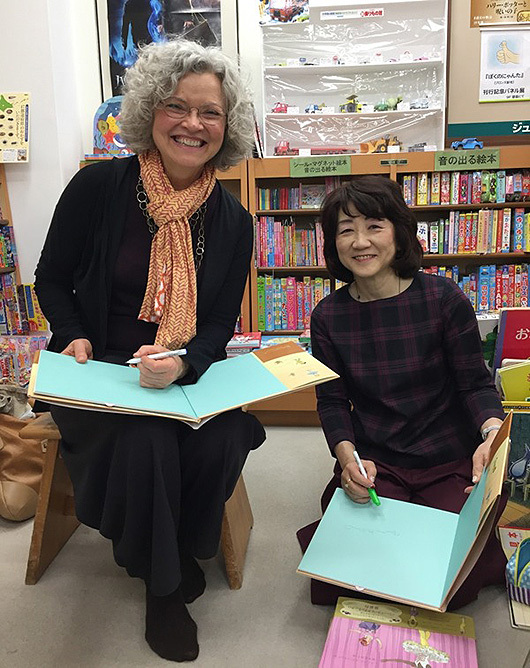 Yumiko and me signing books at the Junkudo bookshop in Tokyo. 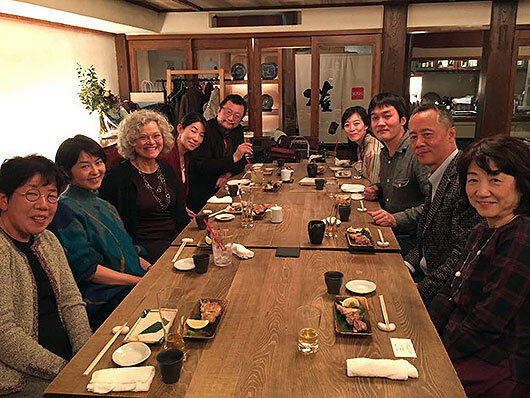 The people behind my Japanese edition books - my publishers, editors, art directors, publicists, book sellers, librarians, and teachers - were gracious, warm, generous, and absolutely delightful. Everyone made me feel welcome and like a rock star! I am so grateful for their hospitality and support. 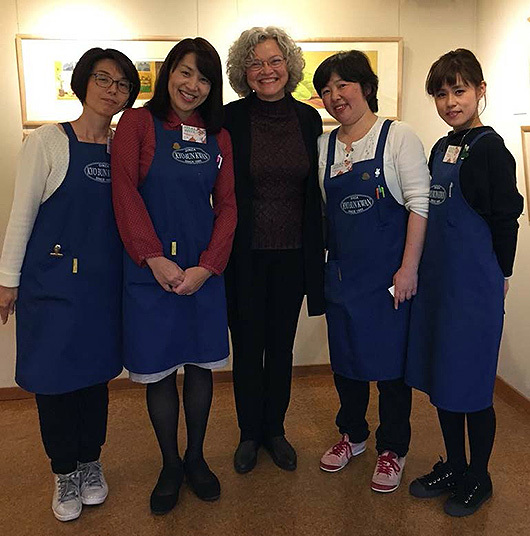 The staff at the Kyobunkan Bookstore, Tokyo. I was interviewed by two magazines and two newspapers in Tokyo. One of the magazine publishers, Mr. Takashi Koyanagi , is also director of the Japan Publishing Industry Foundation for Culture. He is the gentleman on the right in this photo. After the interviews, my publishers Holp Shuppan, Iwanami Shoten, and Asunaro Shobo took me out to dinner. With my interpreter Maya Yoshimoto. 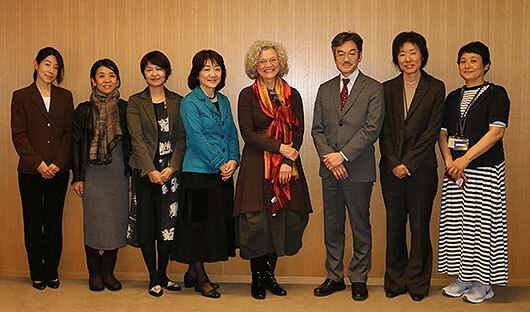 I gave a lecture at the National Diet Library International Library of Children's Literature, which holds one of the world's largest archives of children's books from almost every nation. 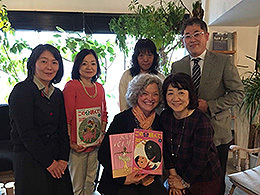 After the lecture with the intrepid team from publisher Holp Shuppan, Yumiko and me, and the International Library of Children's Literature general director Mr. Tadahiko Motoyoshi, and library staff. 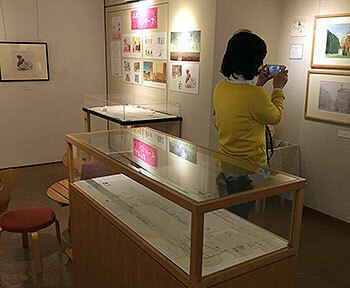 In tandem with the lecture and book signing events was an exhibit at the Kyobunkan Gallery of the original art from MARY AND THE MOUSE, THE MOUSE AND MARY, and EMMA AND JULIA LOVE BALLET, including sketches, letters, and dummy books. 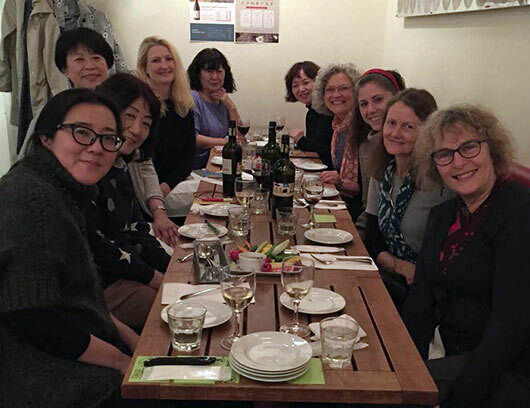 I gave a workshop for SCBWI Japan. The dinner afterwards was fabulous! I'm extremely grateful to share my books with readers in Japan! My newest book, EMMA AND JULIA LOVE BALLET is due out February 2016, and it's already getting lots of praise! “Emma wakes up early. Julia wakes up early, too…They both have ballet lessons this morning.” McClintock follows young Emma as she goes to her ballet lesson and professional dancer Julia as she attends company class and rehearsals, pointing out similarities in their days (“Both teachers make them work very, very hard”). A lively mix of page layouts keeps the pattern fresh—as do several differences (“Some of Emma’s friends dream of dancing on Broadway. Some of Julia’s friends do dance on Broadway”). Soon, these characters’ stories intersect: Emma will be attending Julia’s performance that night. 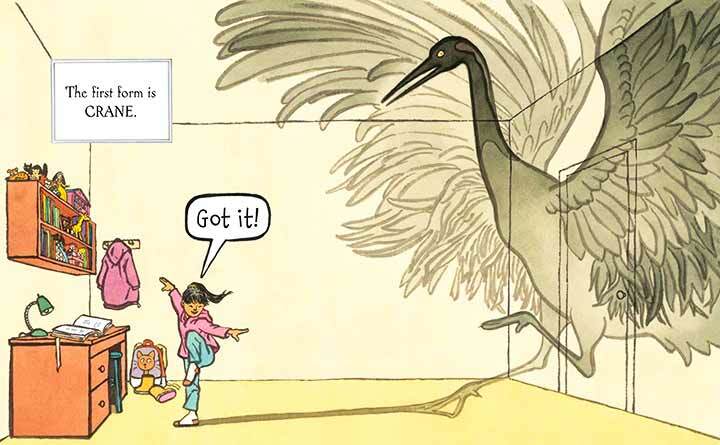 The back-and-forth vignettes continue as both characters prepare for this exciting event, and the story culminates in a double-page spread of Julia’s glorious grand jeté at center stage, followed by a heartwarming encounter between the two dancers. McClintock’s fine-lined pen-and-ink, watercolor, and gouache illustrations ably capture Emma and her classmates’ youthful movements and Julia’s technical proficiency and grace. Along with the similarities and differences in the two dancers’ routines and surroundings, readers will spot many ballet-centric details. This engaging and matter-of-factly diverse (Julia is African American) behind-the-curtain look at a ballet dancer’s life will be appreciated by young dancers, who will see both a reflection of their own experience and a glimpse of what’s to come. Feb 2016. 32 p. Scholastic, hardcover, $16.99. (9780439894012). Ballet is the best thing in the world to Emma and Julia. They both wake up early in the morning and go to dance class, where they adore their teachers, stretch, and spin. Yet there’s something very different about these two ballerinas. 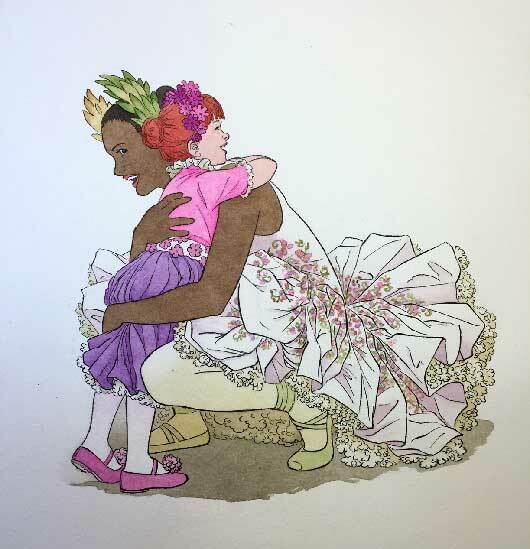 Emma is a little red-headed girl learning her first positions, while Julia is a young African American woman in a professional ballet company. On every spread, McClintock (ADELE & SIMON, 2006) mirrors the girls’ respective days using simple, direct text to highlight similarities and differences: “Emma’s mother drives her to her lesson. / Julia takes the bus by herself.” Her lovely illustrations in pastel watercolors, inks, and gouache effectively contrast the young girl with the older. Attention is paid to small, but important, details—the casual clothes Julia wears in rehearsal (most ballerinas don’t practice in tutus) and the “little kid” posture of Emma and her classmates (stomachs pooched out, angular arm positions, etc. ), making for a refreshingly realistic portrait of dance lessons. Their paths diverge slightly when Emma gets ready to see a ballet performance, and Julia prepares to dance in that very show. A tender backstage meeting brings Emma and Julia together at last—a perfect end to a perfect day. 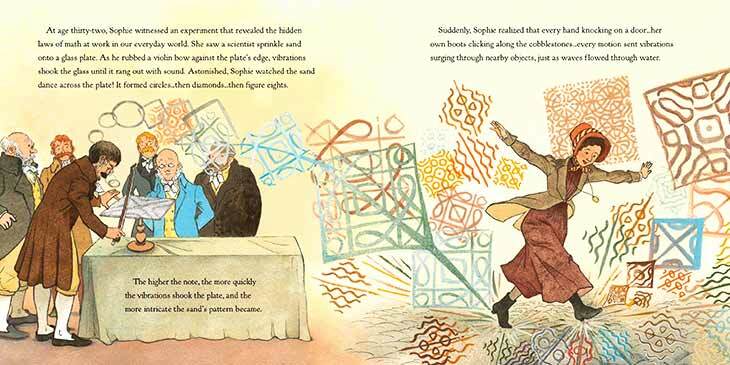 McClintock’s simple story captures the joy of ballet and affirms the idea that dreams can come true. And... a sneak peek from my fall 2016 book LOST AND FOUND: ADELE & SIMON IN CHINA! 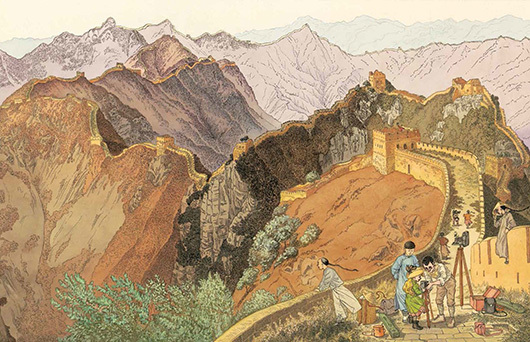 Adele & Simon are in Peking in 1905, and Simon has lost his flute. Can you find it? MY GRANDFATHER’S COAT has won the 2015 gold medal in the Sydney Taylor Book Award’s Younger Reader category. Such great news! WHERE’S MOMMY? has won a New York Times 10 Best Illustrated Books of 2014 award and has been named by the Huffington Post Best Picture Books of 2014 as an honorable mention under the Best Friendship category. 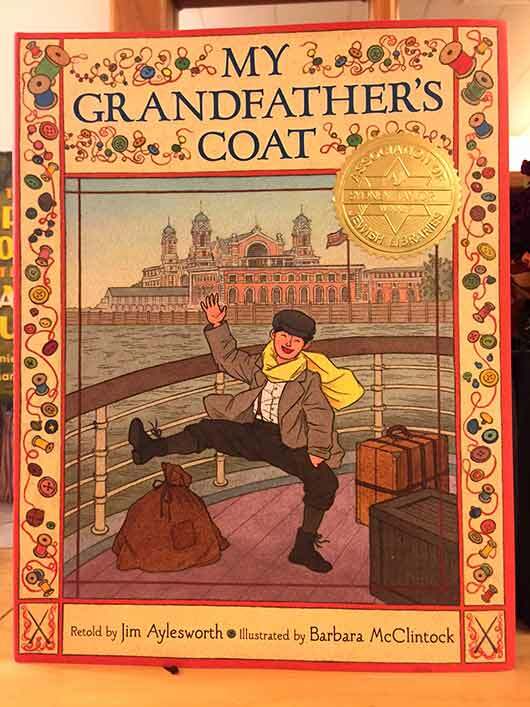 And MY GRANDFATHER’S COAT has been chosen as a Publisher’s Weekly Best Books of 2014 list selection, and a School Library Journal Best Books of 2014 list selection and has also received a Huffington Post honorable mention under the Best About Family category. 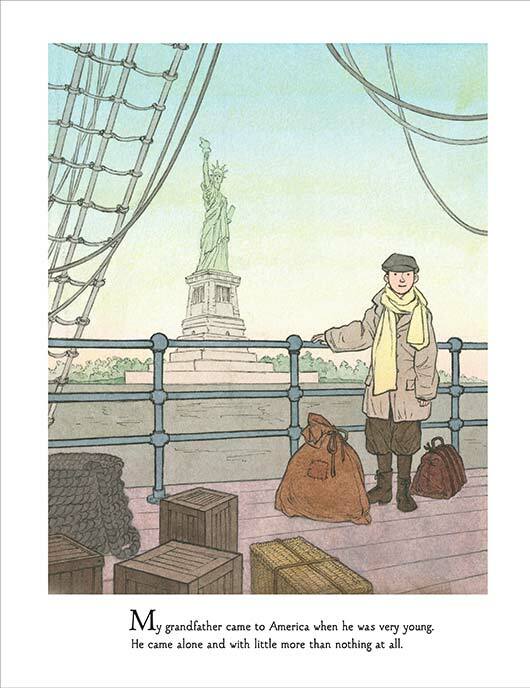 MY GRANDFATHER’S COAT was praised in the NY Times Book Review ‘Special Fall 2014 Children’s Issue’. 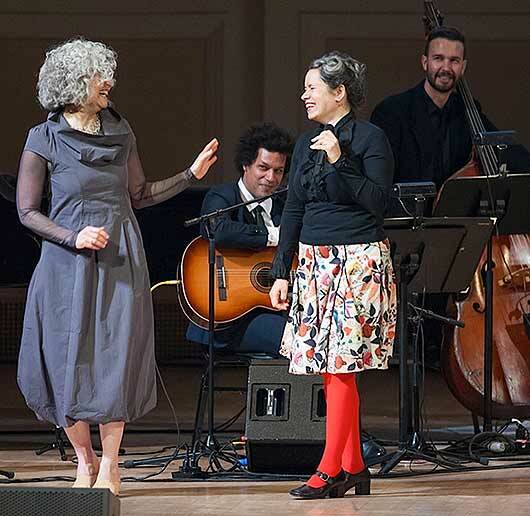 On April 26th 2014 Natalie Merchant performed a concert at Carnegie Hall based on our book-and-music project LEAVE YOUR SLEEP. 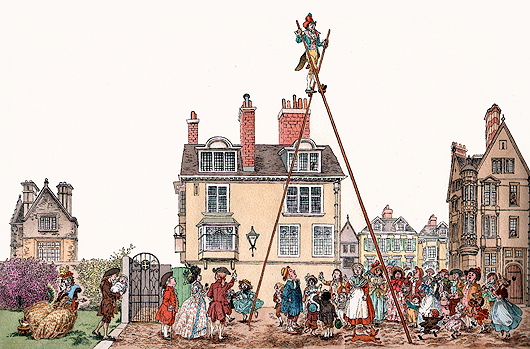 The concert featured the nursery rhymes and lullabies by 19th- and 20th-century poets set to Merchant's beautiful melodies, with chamber orchestra, and projected illustrations by Barbara McClintock. Seeing my illustrations from the book projected ‘as big as a barn’ behind the performers on stage was one of the most magical moments of my life. The images had a vibrancy of their own, transforming from black and white line drawings blossoming to full color. Vignettes moved across the screen as Natalie performed. At one point, Natalie brought me on stage to take a bow. Never in my wildest dreams did I think I’d ever be on stage at Carnegie Hall. Thanks to the generosity of Natalie Merchant, I've had that incredible experience. I guess all the practice from years of drawing finally paid off! Natalie Merchant visiting me in my studio. The bounty of a year's worth of work in the studio has produced two new books coming out in November 2012. 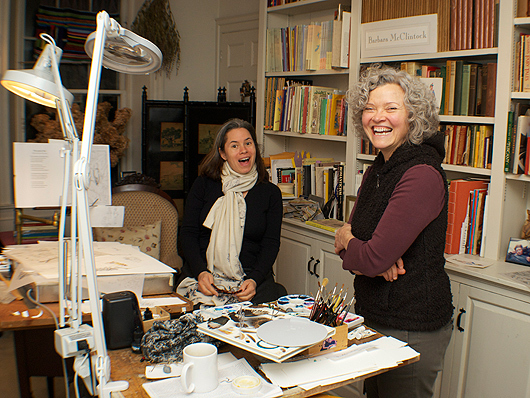 Natalie Merchant's opulent album, LEAVE YOUR SLEEP (click to view trailer), released by Nonesuch in 2010 is now a picture book with illustrations by Barbara McClintock. 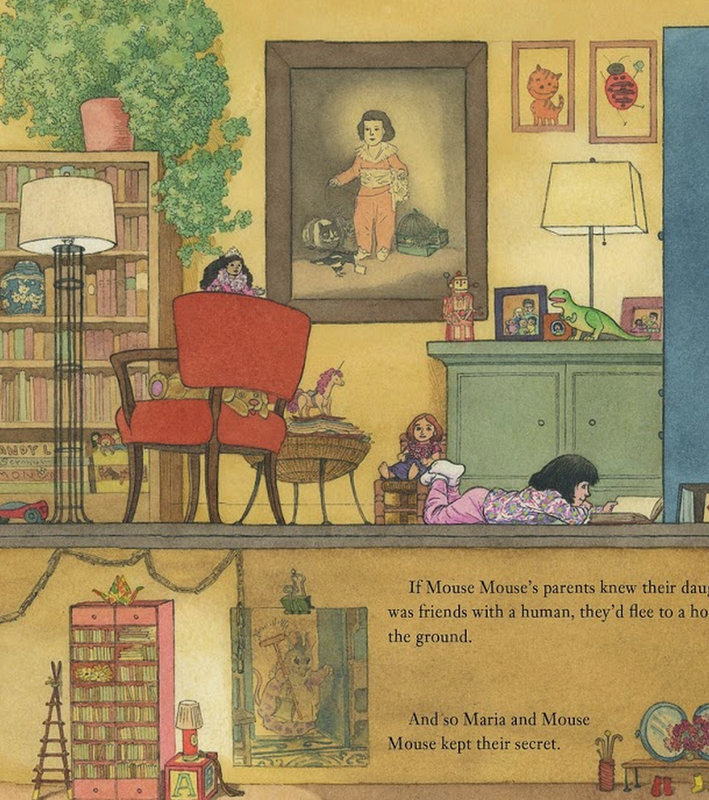 LEAVE YOUR SLEEP is a collection of classic children's poetry put to music by Ms. Merchant as a gift to her young daughter Lucíia. 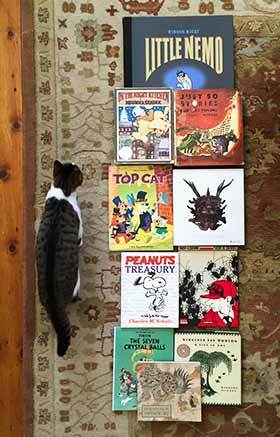 There are 19 poems in the book by authors ranging from Rachel Field, Robert Louis Stevenson, and Edward Lear to e.e. cummings and Jack Prelutsky. Frances Foster Books/Farrar, Straus & Giroux/MacMillan is the publisher. Natalie employs to perfection a variety of musical styles that are matched to each and every poem. Her rich, deep, gorgeous voice provides the link of continuity for this most delightful collection. In January 2011, a friend gave me the album LEAVE YOUR SLEEP, certain that I'd love it. And he was right. After listening to it once, I couldn't stop. I had a flood of visions of characters dancing, brooding, singing and galloping around and around in my head. I knew I had to put those images down on paper, and make drawings to accompany the songs and poems. I contacted my editor Frances Foster to tell her that LEAVE YOUR SLEEP had to be a picture book, and that I had to illustrate it. Frances informed me she'd wanted to make a picture book of LEAVE YOUR SLEEP ever since the album was released in 2010 and was actually in the process of contacting Natalie. Soon after, to our absolute delight, Natalie responded with enthusiasm about extending her album into a book. 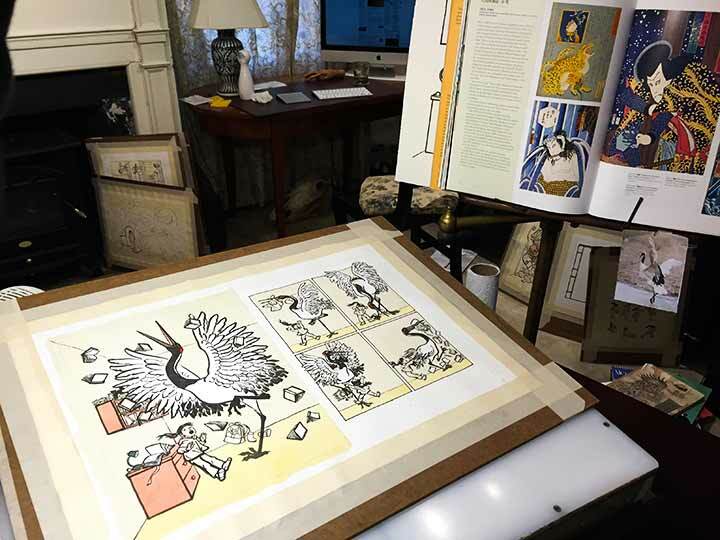 My work process involved trying to channel what Natalie saw in the poems, what the poets saw in their poems, and how I could wrap those tandem voices into the drawings, colors, and characters that both poetry and music inspired in me. Natalie, Frances, art director Roberta Pressel, Frances’ assistant Susan Dobinick and I worked closely as a team, exploring each other's vision for the artwork and design, and finding our way to the final book of LEAVE YOUR SLEEP. "Vain and Careless" by Roberts Graves from LEAVE YOUR SLEEP. There was a strong overlap of Natalie’s and my vision for the artwork in the book from the start. Natalie visited me in my studio in November 2011; we poured over sketches, inked drawings and finished artwork as we talked about the poems, the music, art, and our shared enthusiasm for what would be our future book. At one point we even sang together ( briefly! ) a moment that will forever be one of the highlights of my life. From "Twelve Kinds of Ice." Also coming out in November is TWELVE KINDS OF ICE by Ellen Bryan Obed, published by Houghton Mifflin. The story is a literary skate from the first skim of ice on cold fall nights on through perfect skating ice finally giving way to the last ice of early spring, and summer dreams of next winter's skating. 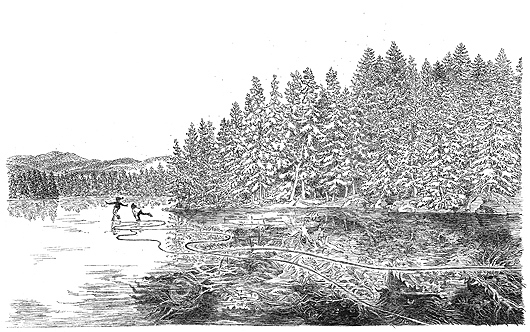 Set in Maine, these written vignettes are illustrated in black and white ink drawings. Ellen Obed’s manuscript charmed me from first reading. The beautifully paced sequencing of evolving stages of ice parallels the activities of a family of passionate skaters that I fell in love with. I felt I knew the world she so skillfully created of approaching winter, and the joys that young people find in nature in even the coldest season. Growing up in North Dakota gave me a perfect background of memories of the sounds, smells, and various visual images of walking, sliding, skating and simply standing on snow and ice. 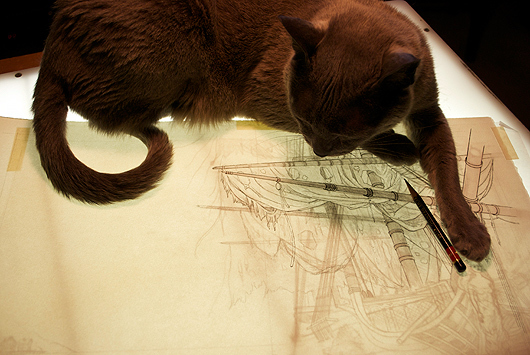 Pip helping me on the drawing board. MARIA AND MOUSE MOUSE, a sequel to MARY AND THE MOUSE, THE MOUSE AND MARY written by Beverly Donofrio/ Schwartz & Wade Books, is on my drawing board at the moment, with MY GRANDFATHER’S COAT written by Jim Aylesworth/ Scholastic Press also in production. ADELE & SIMON IN CHINA is on hold for the time being - stay tuned!